bebop spoken here: Ruth Lambert & Mick Shoulder @ Jazz Café - March 7. 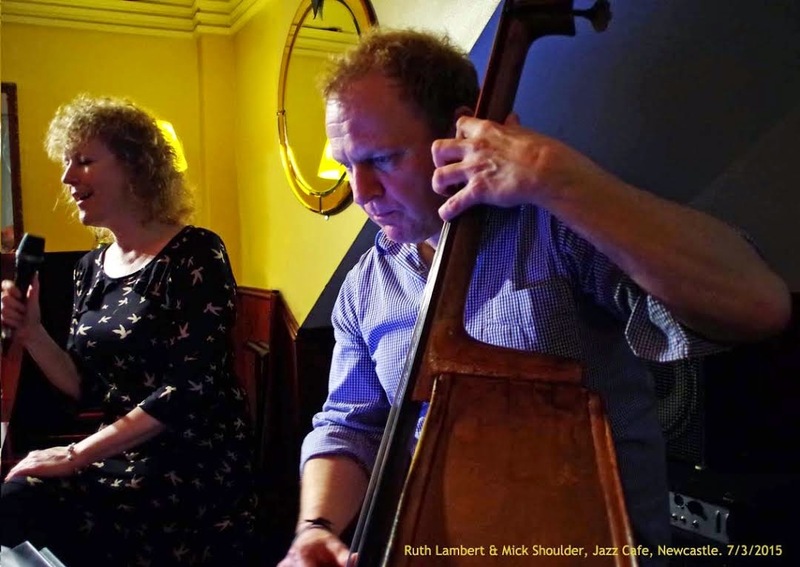 Ruth Lambert & Mick Shoulder @ Jazz Café - March 7. (Review by Kath J/photo by Mike Tilley ). The regular Saturday night ‘Duo Gig’ at the Jazz Café brought another first for two eminent local musicians. Following in the footsteps of artists such as Diana Krall [yet to play the Caff] and our own local lass Zoe Gilby, both of whom understand the vulnerability of being so exposed, Ruth Lambert and Mick Shoulder picked up the gauntlet and excelled in this new venture. With just Voice and Double Bass there is nowhere to hide but, to their credit, they didn't need to (hide)! The jazz Café was well populated with most seats taken, and a few standing at the bar, a different but very attentive audience compared to the usual barflies found at this location on a Saturday evening. The gentle, warm, mellow, tones of Mick’s Bass, complemented Ruth’s versatile voice perfectly and there were some outstanding solos from this accomplished player. Ruth’s consummate ability and experience shone through the 21 numbers that demonstrated the duo’s flexibility in a varied set that ranged from beautiful ballads like Jolene, through a few of the standards from the gasbook, to a superfast upbeat version of One Note Samba… My personal favourites were Bye Bye Blackbird, The Snake, Softly as in a Morning Sunrise, (Mick’s arrangement was superb) and Love Me or Leave Me… Oh and a breathtakingly, sleazy ballad version of Love for Sale; an utter joy to hear!